Hi! 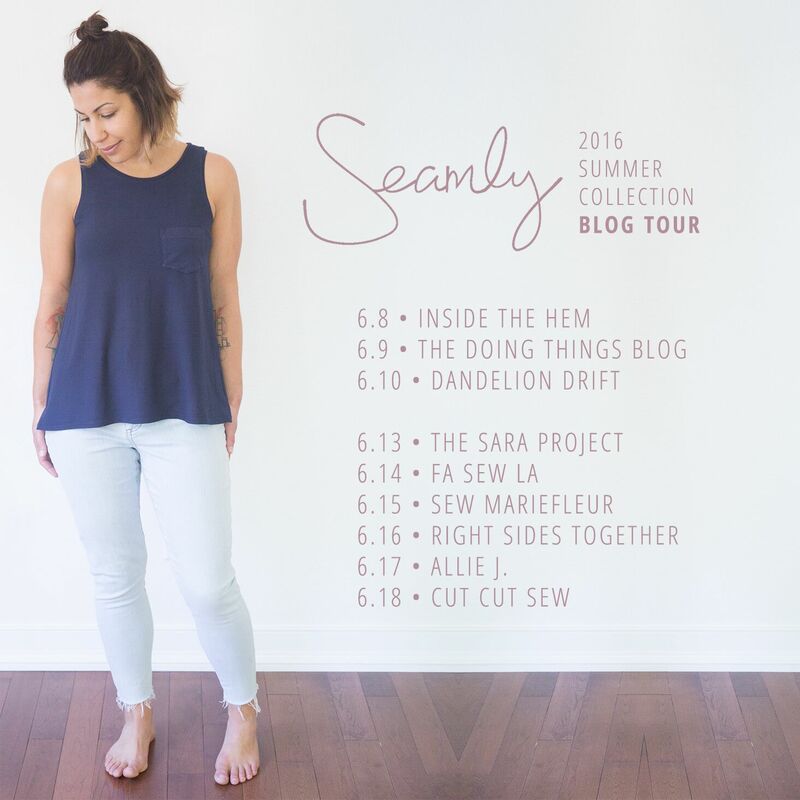 I am so happy to be part of the blog tour introducing the new Seamly collection from Indiesew! Seamly is a US based company with a mission to produce apparel responsibly– using either surplus fabric, fabric that is knitted in the US, or fabric that is sustainably and responsibly made overseas. (That info is from the about page on Seamly’s website and you can read more here.) 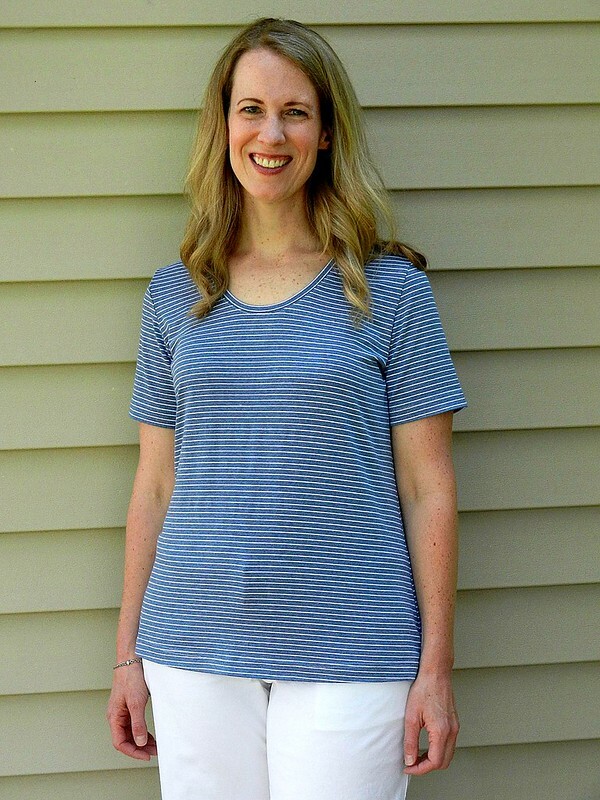 Allie, the co-founder of Indiesew, collaborated with Seamly to release sewing patterns for three styles that Seamly will no longer produce. I used fabrics from the Indiesew fabric shop for my Basic tee and Wrapped Cardigan and I am so happy with how they turned out. 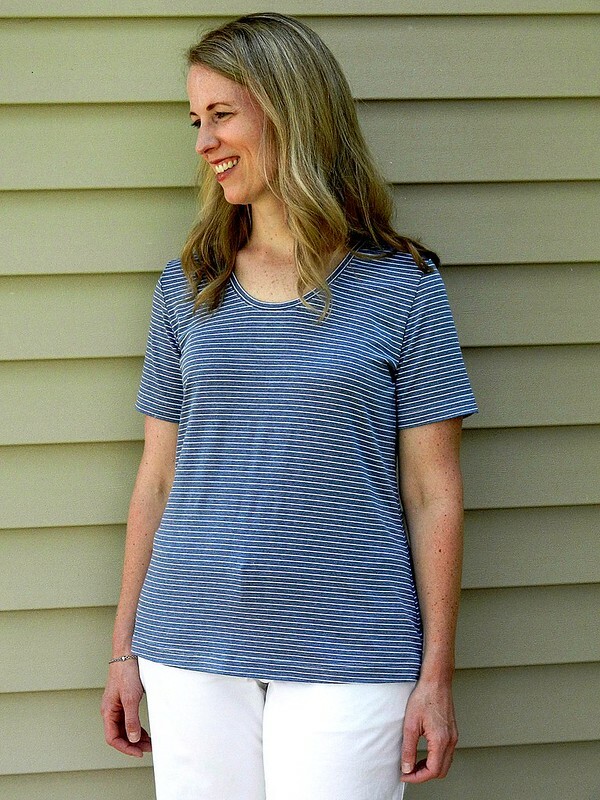 The basic tee is a great, loose fitting, scoop neck tee. I know I am going to be wearing this a lot this summer! I made a size medium graded to an XL at the hips and I love the way it fits. 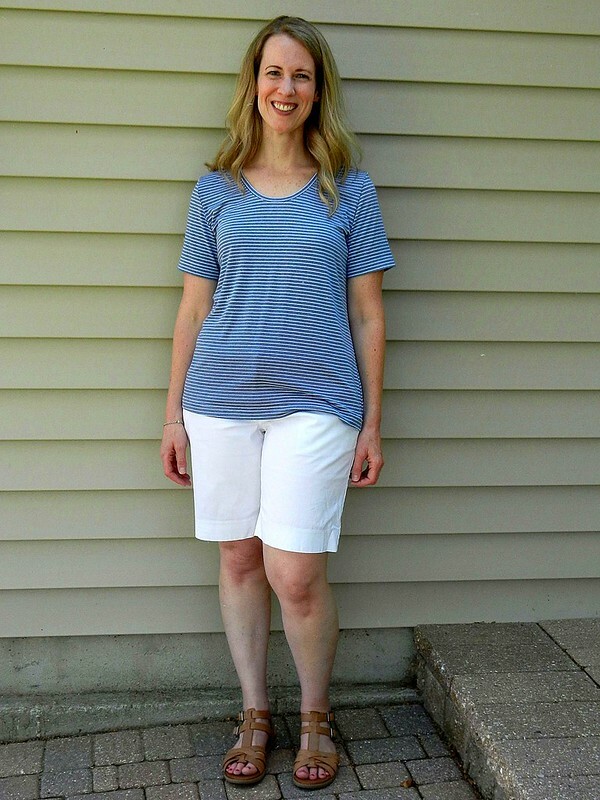 I ended up shortening the t-shirt by an inch (I am just about 5’8″.) My only other change was to do my standard forward shoulder adjustment. I am completely in love with my Wrapped Cardigan. I think there are a lot of different ways that this pattern can be worn but I know I will probably always wear it loose over a t-shirt with jeans/pants. 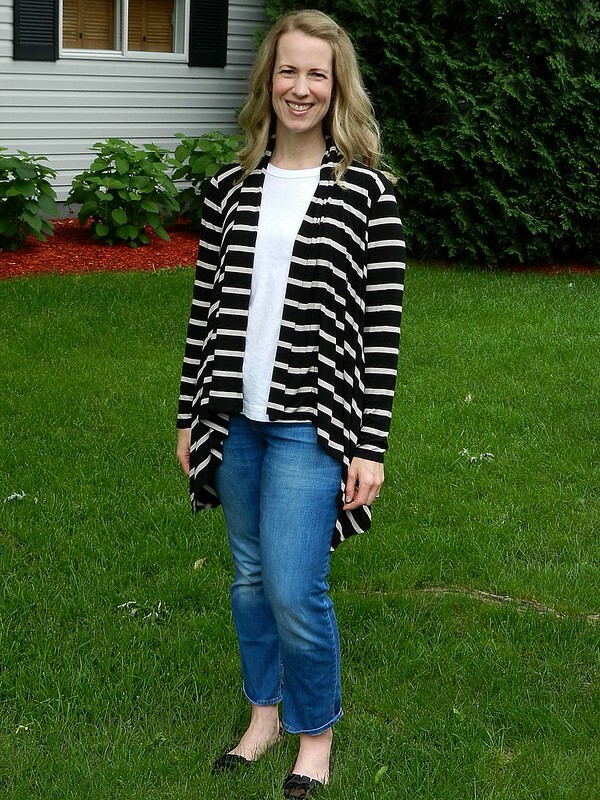 I have been reaching for this cardigan on cool evenings when we are outside playing with the kids. 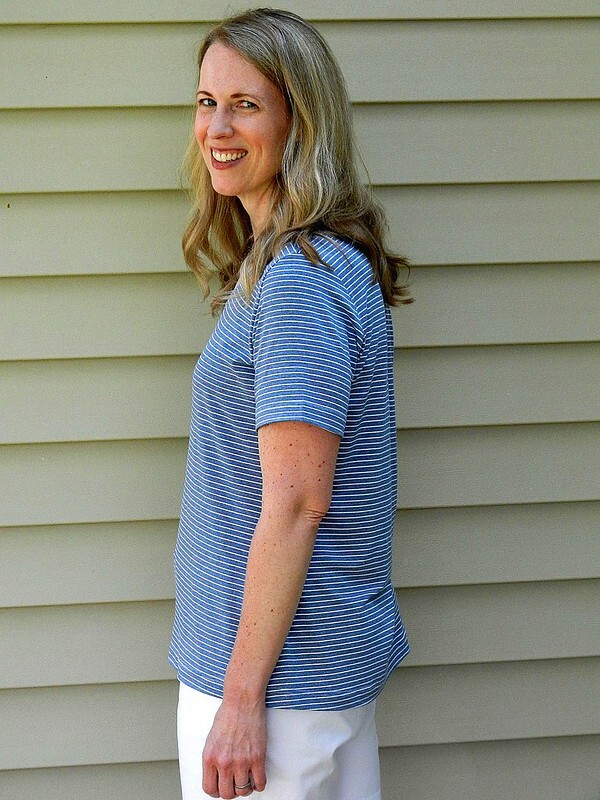 I love the swingy style and in the rayon/lycra jersey it’s the perfect weight. I made a size medium graded to XL in this, too, but when I tried it on before hemming I felt like it was too long. I ended up cutting off 6″ from the bottom and I am much happier with the length. When I cut off the bottom I think I lost some of the grading so it’s probably closer to a medium graded to a large. It is so swingy that I think this ended up being perfect. The only problem with cutting off the hem was that I lost use of the hidden inside pockets, which I think are a fun feature of this pattern. I could stand to do a forward shoulder adjustment on this one, too, but based on the shape of the pattern pieces I wasn’t sure how to execute it. Now that I’ve constructed it once I think I should be able to figure it out pretty easily. I will probably get a chance once Fall rolls around because I’m sure I’ll want to make another one in a solid color. I hope you check out the other stops on the blog tour! 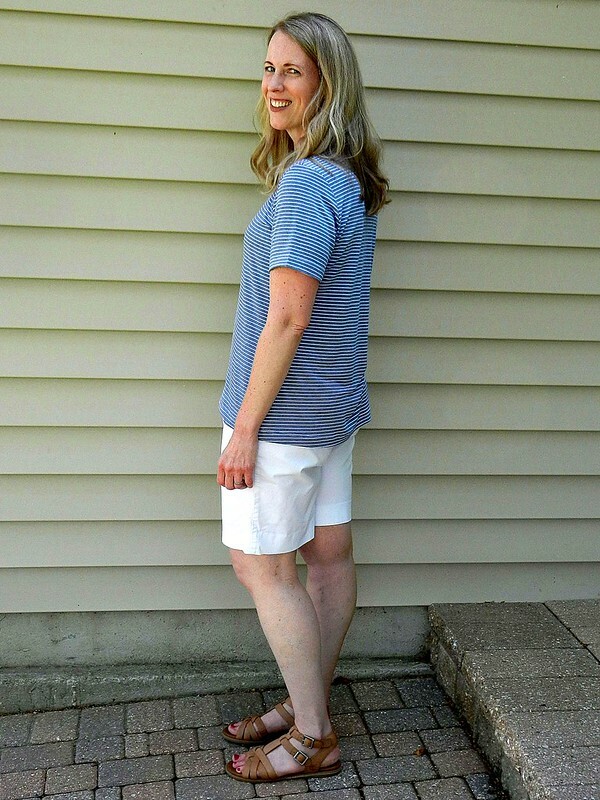 I always love seeing how different people sew/wear the same pattern and there have been some amazing posts so far. I like both the garments but especially the cardigan. It fits you well. What do you mean by your standard forward shoulder adjustment? I am NOT a garment sewer…still reading a lot. I learn a lot by reading your blog. I looooove this cardigan! It looks so good in the striped fabric. I’ll definitely be sewing up this pattern come fall! Thanks, Lisa! I think you’ll love this pattern. It’s got really nice finishing and comes together quickly. It’s so nice to wear, too! Both these pieces look great on you Teri! I am in love with your striped cardigan though – it looks amazing!! Thanks, Heather! The cardigan is a new favorite. It’s so nice to wear!